At today’s Chamber Board of Directors meeting, JoAnn West received the Chair of the Board Award in the field of youth development. This award is designed to honor individuals who have made a significant contribution to the community in a specific field of endeavor, and no more than six recipients may be named in a calendar year. In 2008, West became the proprietor of Fiesta Lanes and has built a strong Special Olympics and youth bowling program there. She also built a successful high school bowling program that now features six schools that have won four state titles. These programs have distributed more than $200,000 in scholarships since her arrival in New Braunfels in 2005. West’s first introduction to bowling was through her mother at Park Place Lanes in Port Arthur, Texas. She later worked at Gateway Lanes in Beaumont during her teenage years and her fellow junior bowlers included future PBA Hall of Famers David Ozio and Mark Williams. West returned to the sport in 1990 and worked as a league coordinator at Brazosport Lanes where she built an impressive Saturday youth program, giving away thousands of dollars in scholarship money there. In 1999 as league coordinator in the Texas Panhandle, West and her husband purchased Harvester Lanes and she recreated the same level of success as she had in the Lake Jackson area with a thriving program, as well as creating a Special Olympics program. 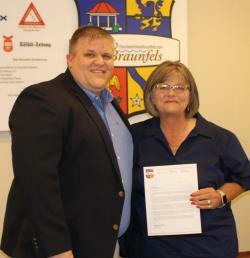 After her husband passed away, she sold Harvester Lanes in 2005 and began working for her former employer becoming an area manager for all of his properties, which included Fiesta Lanes in New Braunfels. For these reasons and many more, West is the fourth recipient of the Chair of the Board Award of 2017. Henry Ford received the award in the field of race relations in February, the Sophienburg’s Myra Lee Goff was honored in the field of heritage preservation in April, and local businesswoman Becky Wiggins most recently received the award in the field of philanthropy in May. West will be invited as a special guests to the Annual Chamber of Commerce Banquet on January 26, 2018 where she will be further honored.